In an interview to Restaurant India, Chef Dheeraj Mathur, Master Chef, Radisson Blu- Paschim Vihar talks about bringing innovations in menu. I started my journey in 2000 after completing my education. Working as a kitchen trainee with Le Meridien Delhi for almost two yeras I learned the basic kitchen techniques. I have worked with hotels like Trident Kochin, Radisson Blu Plaza Mahipalpur as comy in Great Kebab Factory. So, I learned most of the kebabs from Chef Miraj and wakil Ahmed Qureshi. They gave me some of the secret recipes to making Galouti Kebab, Kakokri Kebab. The, I moved to Varanasi, Taj harimahal Jodhpur and learned some of the Rajasthani dishes like safed maas, laal mass, dahi ke kebab. Then, I again joined Radisson Great kebab factory in Dubai. And, now I am working with Radisson Blu Plaza Paschim Vihaar for almost five years. What is your biggest learning from these movements? I have tried to learn the regional cuisines of the places I have travelled to. I am very grateful to the chefs and team for my learning. What was the most proud moment for you? When I was in Dubai, we served traditional Indian kebab and people enjoyed it there and that was the greatest achievement. 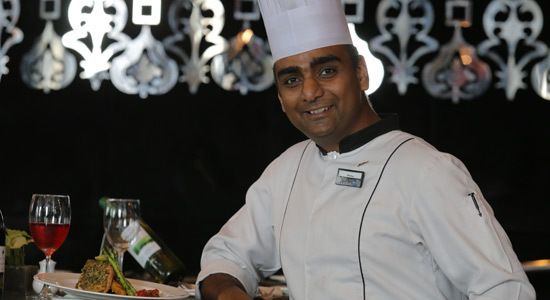 What’s your responsibility working as a master chef at Radisson? My responsibility is to create new recipes and bring in continuous innovation. It also involves creating a standard recipe and look after it as the consistency should be same throughout the year. We also train staff and their skills matching Radisson’s standard. What trend do you see in fine dining segment in India? Kitchens are opening in a live way, and its trending. We also focus on live kitchen concept so that people should be aware of what they are being served. What’s the reason for fests that you organise? It’s because we have to attract new customer and as summer days are dull days for business this is great tactic to attract new customers. Also, such festivals innovate new tastes for our regular customers. And, as most of the people in this locality are Punjabi we are hosting a Punjabi food festival. Also, we are keeping a record of the likes of the customer so that when we revive our menu we will include that in our menu. What is the average footfall at Indyaki? On regular days we get 80-100 whereas on weekends it goes up to 150.